FOREIGN CONFIDENTIAL: What Will Happen if Iran Gets Nuclear Weapons? What Will Happen if Iran Gets Nuclear Weapons? EDITOR'S NOTE: Barry Rubin is director of the Global Research in International Affairs (GLORIA) Center, where this article first appeared, and editor of the Middle East Review of International Affairs (MERIA) Journal. His most recent books are The Israel-Arab Reader (seventh edition), with Walter Laqueur (Viking-Penguin); the paperback edition of The Truth About Syria (Palgrave-Macmillan); A Chronological History of Terrorism, with Judy Colp Rubin, (Sharpe); and The Long War for Freedom: The Arab Struggle for Democracy in the Middle East (Wiley). To read and subscribe to MERIA, GLORIA articles, or to order books, click here. Despite all the talk about Iran getting nuclear weapons, there is a huge misunderstanding about what this would mean. The only scenario discussed is whether or not Iran's regime would use such weapons to attack Israel. The chance of that happening is relatively small statistically, but that outcome would be so horrifying it looms far larger. There are real reasons to think that a nuclear Iran would not accept Israel's existence and will try to wipe Israel off the map, killing millions of people and triggering a war far worse than the Middle East--or the world--has ever seen. Still, if that is the "only" problem that would result, the key argument is whether or not it would happen. And if that is the "only" problem, it is going to be primarily a matter of concern for Israel and those who might care about its fate. But there are a number of other scenarios far more likely to occur if Iran's regime gets nuclear weapons and these have a dramatic effect on the interests of every Western and every Arabic-speaking country and more besides. contrary to Iran's desires out of concern that Iran would use nuclear weapons against itself, its troops, or others. 2. 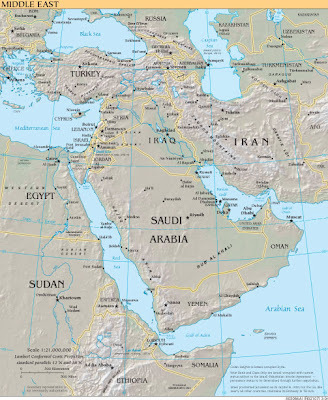 A nuclear Iran would intimidate all Arab regimes to appease Iran including, for example, rejecting Western basing rights or alliances. They might well believe that the United States is unlikely to go to nuclear war for them. Better get the best surrender terms from Tehran. This means forget about any Arab-Israeli peace. Arab cooperation with the West would plummet. Western citizens and interests in Arabic-speaking countries would be in great danger. Arab states would be afraid to cooperate with the United States in resisting the expansion of the Iran-Syria bloc and are far more likely to join it. Islamist regimes are more likely to take over in many countries. 3. A nuclear Iran would lead to a huge upsurge in radical Islamist movements and their recruiting. With hundreds of thousands of Muslims joining such groups, the existence of every Arab regime would be jeopardized; terrorism and regional instability would rise. 4. Large numbers of Muslims living in the West would also join radical Islamist groups believing the day of victory is at hand and that Iran has shown the way. Terrorism and other violence and instability would rise throughout the West. 4. The price of oil, given understandable belief by consumers that the region will be more unstable will climb even higher than it is now. In addition, the tremendous power that Iran--a price hawk--would have ensures it will push up the price and the Saudis would be too intimidated to try to push it down. 5. A nuclear arms race would be triggered in the region which would greatly increase the likelihood of a nuclear war between two or more Middle East countries as well as such weapons getting into the hands of terrorists. In short, far more than Israel's existence is at stake in this issue. Even those who don't care about that or who think--perhaps correctly--that the Iranian regime would never attack Israel with nuclear weapons should pay close attention to these issues.